On this date in 1548, the Spanish crown cemented its authority over the territory of the former Incan Empire by beheading its rebellious conquistador authorities. No, Gonzalo had a more prosaic specialty: killing. While big bro went off to pacify more territory, Gonzalo along with siblings Hernando and Juan, the Baldwin brothers of New World conquest, chilled in the former Incan capital Cusco and sparked a rebellion in the 1530’s with their iron-fisted rule. Appointed Governor of Quito in 1541 — he forced the appointment with some exemplary hangings — Gonzalo was just the sort to get a burr in his saddle when the Emperor Charles V promulgated the New Laws requiring slightly less crappy treatment of the natives. And that was a low bar to clear indeed. More urgent than “recreation,” Pizarro (and many of the New World’s new landholding elite) were miffed that meddlesome European bleeding hearts types were going to cut into their profit margins. 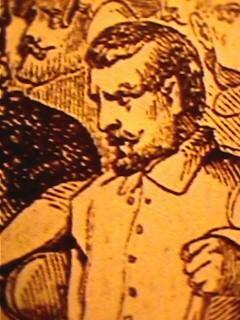 Pizarro revolted, enlisting the brilliant officer Francisco de Carvajal, a longtime fixture of the Old World battlefield. Now an octogenarian, he had lost neither vigor in command, nor cruelty in conquest. (He played bad cop to Gonzalo’s good cop.) The two killed the guy sent to impose the emperor’s decree. This uprising forced the next Spanish viceroy to repeal the hated New Laws in order to win political support against Pizarro and Carvajal — a happy outcome for Pizarro’s base, but not for the conquistador himself. Pedro de la Gasca’s adroit diplomacy caused the entire rebel force to desert before the fight at the “Battle” of Jaquijahuana in Sacsayhuaman. Carvajal was hanged and Pizarro beheaded, both of them winding up on pikestaffs at the gates of the city Francisco Pizarro had founded — Lima. Their partnership — and the arc of Spanish exploits in the New World — is covered in this Google Books freebie.